In the name of Jesus Christ, Archbishop Abuna Yesehaq of the Ethiopian Orthodox Church baptized music icon Bob Marley before he died. Some claim the baptism marked Marley’s conversion to Christianity. Did Marley disown the Twelve Tribes of Israel, a Rastafarian order which honors the Ethiopian Emperor Haile Selassie (1892-1972) as the divine “King of Kings and Lord of Lords”? Like an Apostle Paul, Bob Marley had spread the teachings of the Twelve Tribes of Israel “to the ends of the earth”. Perhaps Marley had come to believe Jesus and Haile Selassie (a.k.a. Ras Tafari) shared the same spirit. Whichever dogma Bob Marley favored in the last days of his life, he never shed his Rastafarian identity. You don’t need dreads or smoke ganja or beat Nyabinghi drums or listen to reggae music or worship Haile Selassie or be black to be a “rasta man” who lives from the heart. Rastafarians are a diverse people with many sects and adherents who don’t affiliate with any sect. Rasta is simply a way of life with a common goal of “One Love. One People. One Destiny.” — all bound in unity with Jah (God). California smokers to be evicted for smoking in rental homes? Today, the California Senate Judiciary Committee will consider Senator Alex Padilla’s bill to explicitly allow owners of rental housing the option to ban smoking on all or a portion of their property. Currently, California landlords are being sued by smokers opposed to their non-smoking rules and by non-smokers for not setting non-smoking rules. Some critics who are empathetic for the poor contend the bill, if made into law, would cause a huge wave of homeless smokers and their families. Other critics eager to protect the health of their fellow Californians say the bill is too soft and call for the ban of smoking on all apartment complexes. I say Padilla’s bill is the common sense solution to the problem. Whose property is it anyway? The landlord should have the right to ban or allow smoking anywhere on his property. If tenants don’t like it, they should rent elsewhere. Trust in the free market forces to clear the way for an adequate supply of rental units for smokers. Indeed, we live in a crazy world. I am not one to advocate dismantling a powerful American defense, which includes deterrence with nuclear weapons. Liberty must be protected with a feared military defense. However, this notion of a preemptive war strikes a dangerous chord and crosses the boundary of a legitimate defense. If there is a lesson learned from the Iraqi War, I hope it’s the realization of the insanity of a preemptive war strategy. For an interesting and recent editorial piece on the insanity of war, read Paul C. Campos’s Warrior envy, mass psychosis and McCain. Much of what I was about to write about raw milk has already been said here, so I’ll add just a few things. M.L. Johnson writes: Pasteurization should not affect milk’s taste, texture or nutritional content, aside from a slight loss of vitamin C, said Robert Bradley, a University of Wisconsin-Madison professor who has worked in food science for 44 years. However, the process can destroy proteins and enzymes that help the body absorb vitamins and digest lactose, said Michelle Babb, a registered dietitian who teaches at Bastyr University in Kenmore, Wash. High heat also can damage water-soluble B vitamins, she said. Where I think the raw milk lovers have got it right is cream on top, organic milk from grass fed cows. Cream on top milk tastes better. Organic is safer. Dairy (and beef) products from grass-fed cows is more nutritious. Farmers should market it as such. Why put people’s health at risk and worry about a high probability of litigation by not pasteurizing? To misquote Peter Tosh: Pasteurize it. Don’t criticize it, and I will advertise it. Don’t let Pharmas fool ya with their aggressive television advertising blitz. Their strategy to increase the bottom line: convince healthy people to buy old drugs for “symptoms” they really never had noticed before or shouldn’t worry about. The ads clearly exploit people’s anxieties and insecurities. GlaxoSmithKline’s commercial for RLS (Restless Legs Syndrome) runs more like a Saturday Night Live skit. We’re to believe millions are suffering from this — to quote Justin Rohrlich — “extremely rare condition discovered in 1945 by Swedish doctor Karl Ekborn.” Who ever heard of RLS before this ad was broadcast? It’s not just harmless symptoms they make out to be disastrous, they also target normal behavior like teen rebelliousness, now dubbed by a pharma as “ODD (Oppositional Defiance Disorder)”. TV ads for pharmaceuticals often give the illusion you will enter a Jehovah Witness artist’s rendition of paradise only by swallowing the pills, scenes of happy people strolling in a beautiful nature setting. Calm and almost hypnotic music downplays the warnings of serious side effects, which can cause a very real hellish experience. Indeed, a sharp contrast to the serene images of paradise subtilely suggested. Advertising for smoking is banned for good reason. Adversting for prescriptions should be banned as well. Let the medical doctors dispense drugs without undue influence from the marketers. Wipe the sweat off your brow; the Terminator is not made in Japan! Robots in Japan cannot be more different than the crazed Terminator. Hardwired into their chips is the boy scout creed of “friendly, helpful, courteous.” Leave it to the robots to serve tea, plant rice, prepare sushi, vacuum, and feed the elderly…all without one word of complaint (none filed to date). Don’t say that too loud, Mr. Asami. You might agitate a violent, robotic revolution. Sorry, foreign backpackers. You won’t get a taste of Bhutan’s GNH. Independent travel in Bhutan is forbidden. Visitors must book travel through a registered Bhutanese tour operator, who will arrange for them to be chaperoned from one expensive resort to another. Much worse off than foreign backpackers who can’t pitch tents in Bhutan’s lush valleys, pristine forests, and mystical mountains are the 100,000 ethnic Nepalese who have lived in refuge camps in Nepal since 1990 after a crackdown on their demand for — are you ready for this? — democracy. 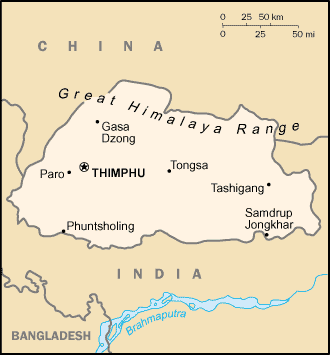 The ethnic Nepalese are disenfranchised because the government considers them illegal immigrants.